Well done to everybody who took part in the Cheshire Championships XC at the weekend. It was a muddy course, designed by Julian from Spectrum, with zig-zag funnels through puddles and some disappearing and reappearing logs to jump over and many small hills to climb, on the multi-lap course at Birchwood Forest Park. So it is with great delight I can inform you that our ladies vets secured 2nd place overall! (Jane, Janet and Rachel). Be sure to congratulate them. Brilliant running from Janet Robertson saw her secure first place V40 and Jackie Keasley following strongly behind was 3rd V50. Well done. Thanks also to Ian Landucci for turning up but suffered an injury mid race and to Joe for his usual and brilliant support on course. 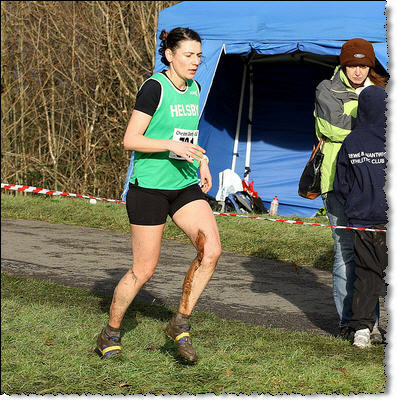 This entry was posted in Uncategorized and tagged birchwood, champs, cheshire xc, cross country. Bookmark the permalink.